Each child is unique. Every child deserves equal opportunities. All children have the ability to dance. What comes to mind when you hear this? – ummm..same as physiotherapy right? – helping people to find jobs! – teaching kids to print? – getting Grandma a raised toilet seat. As Occupational Therapists, Jade and I often struggle with how to fully explain the breadth of OT and how much is involved with what we DO. One of the first (and most challenging) lessons of our OT schooling is developing your “elevator speech”. How you will describe what you do in 30 seconds….believe me, it’s darn near impossible! We tend to cater our response based on who’s asking. I mean, it takes us two whole years in school and many more years of experience to truly understand the meaning of the word “occupation” alone…how can we expect others to “get” what we do without understanding the core concept of our profession!? Occupation: Everyday activities that people do as individuals, in families and with communities to occupy time and bring meaning and purpose to life. Occupations include things people need to, want to and are expected to do! Got it? (it’s ok if you don’t…). Occupations generally fall into three categories: SELF-CARE (bathing, toileting, grooming, feeding, etc. ), PRODUCTIVITY (work for adults, play for children, volunteerism, etc. ), and LEISURE (recreational activities, hobbies, sports, etc.). Our role? To ENABLE people to DO any of these things!! (Sounds pretty tough right?). So it’s true…we actually DO do most of the things I listed above, but also SO MUCH MORE! 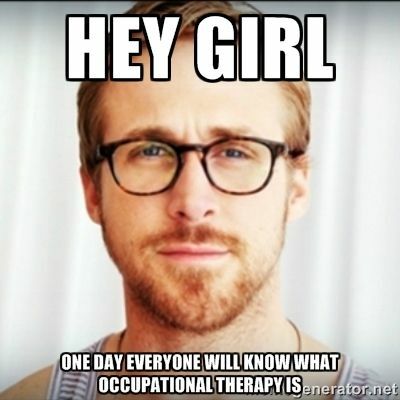 Here’s a few QUICK tips to introduce you to Occupational Therapy. *We are REGISTERED HEALTH PROFESSIONALS. *We have completed a two year MASTER’s Degree in Occupational Science and Occupational Therapy, following our four years in undergrad (studying health sciences and kinesiology). Anywhere!! OT’s may be found in hospitals, clinics and schools, but we also work in the community, in people’s homes, and anywhere where people are LIVING THEIR LIVES! Anyone!! Based on our experience and training we have knowledge of MANY health issues (both physical and cognitive), but the purpose of our profession is not specific to a certain disorder, it’s based around enabling people to participate fully in their everyday lives, so ANYONE could benefit from Occupational Therapy at some point in their lives. Occupational therapy is the art and science of enabling engagement in everyday living, through occupation; of enabling people to perform the occupations that foster health and well-being; and of enabling a just and inclusive society so that all people may participate to their potential in the daily occupations of life (Townsend& Polatajko, 2007, p. 372). The amazing breadth and diversity of our knowledge and skills could be considered both our greatest assets as well as our biggest challenge. When you look at how much goes into our role in teaching and co-ordinating Dance Ability classes…it’s no wonder families and students continue to comment on the quality of our classes and how much their child succeeds in Dance Ability. For us, watching our dancers PARTICIPATE fully in their community, and reach their own unique POTENTIALS is our very own dream come true. When you really delve into it….OT’s are pretty amazing…and believe us, it is a highly challenging, interesting, ever-changing, but most of all, REWARDING career. We were fortunate to be published in a section of the Canadian Association of Occupational Therapy’s special edition of OT Now Magazine for March/April. Members of CAOT can check out more about Dance Ability as one of the Snapshots of “Visions of Possibility” on page 27. We are working towards establishing Dance Ability as an Occupational Therapy program (although it is currently classified as a DANCE class – which happens to be taught by two OT’s; we are realizing how much it really does involve our OT skills). Muscular Dystrophy Canada is a nonprofit whose mission is to enhance the lives of those affected with neuromuscular disorders by continually working to provide ongoing support and resources while relentlessly searching for a cure through well funded research.